Earring, imitation rhodium-finished steel and brass, 49mm with brushed cutout design and hinged ear wire. Sold per pair. Item Number: H20-6913JD Have a question about this item? 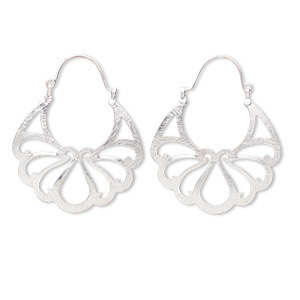 Cutout-design earrings have lightly brushed surfaces and feature hinged ear wires. Ideal resale items that display well and sell with ease, these designs are great additions to your jewelry lines.